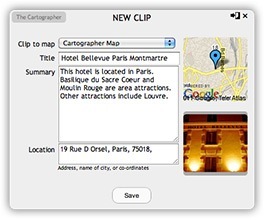 Google, Location, Maps, The Cartographer, Web, Webapps. Bookmark the permalink. Both comments and trackbacks are currently closed. ARRGGHH!! We used Cartographer for a 4-month trip through Asia and are planning the next trip, to Europe for six weeks this fall. My husband just had me try to install Cartographer on this computer. We are SO sorry to hear you are retiring it! Any hope for the future or any suggestions for finding similar capability? Thanks. I’m sorry about that Sandy! Yes, I’m afraid its time has come – it was a hard decision though. You can still use Cartographer on the other iPhone, if you know how to transfer the app from one to the other using iTunes. Otherwise, I’m afraid I haven’t done a great deal of research on alternatives – but do let me know if you find any promising candidates!